Why are there so many cats in Istanbul? 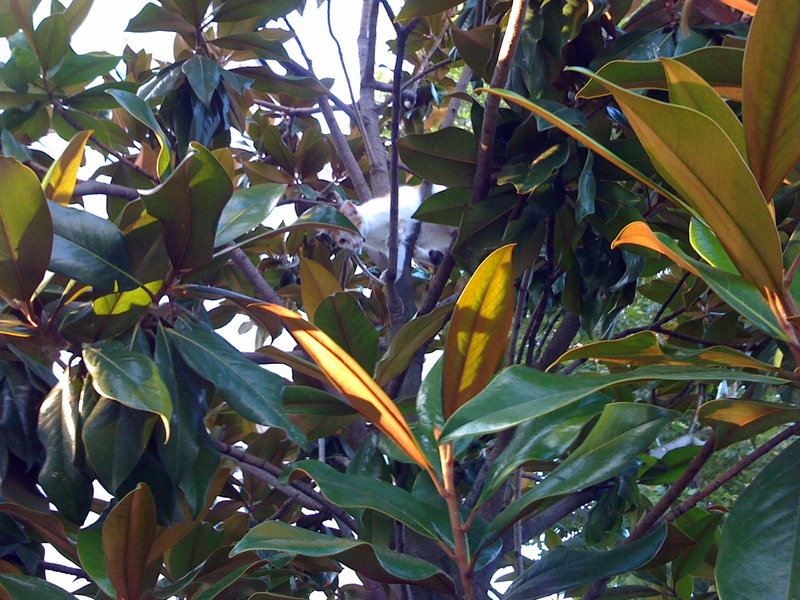 I've heard they're everywhere, inhabiting public space as if it were their own. These cats are apparently very social as well. One of them famously greeted Barack Obama when he visited the city. Some explanations point to Mohammed's love of cats inspiring popular tradition in places with large Muslim populations. 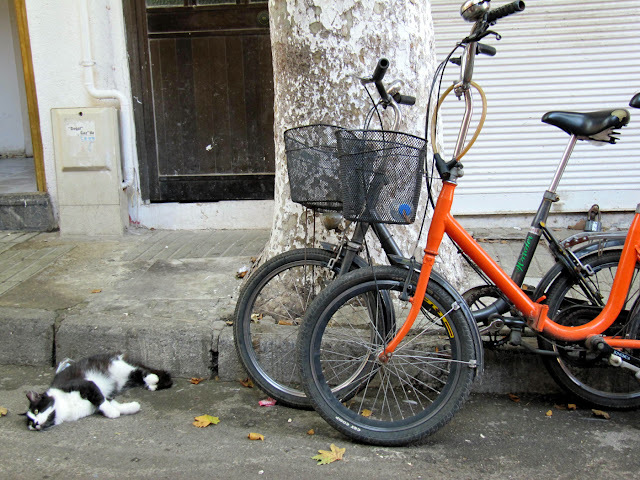 Whether or not most Istanbul residents love street cats, they certainly tolerate them. 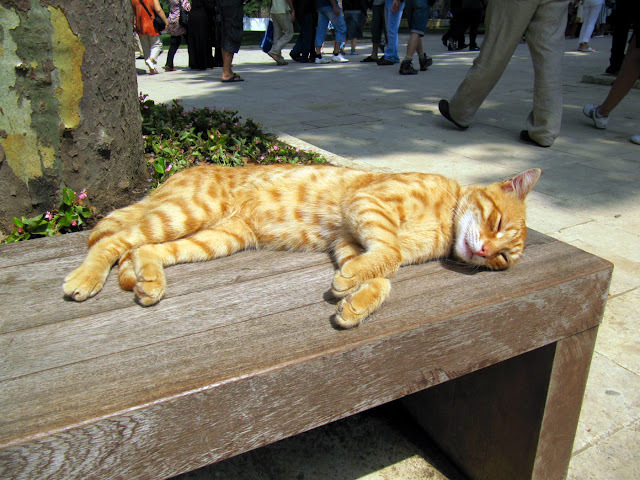 In response, cats have become remarkably comfortable in the city. 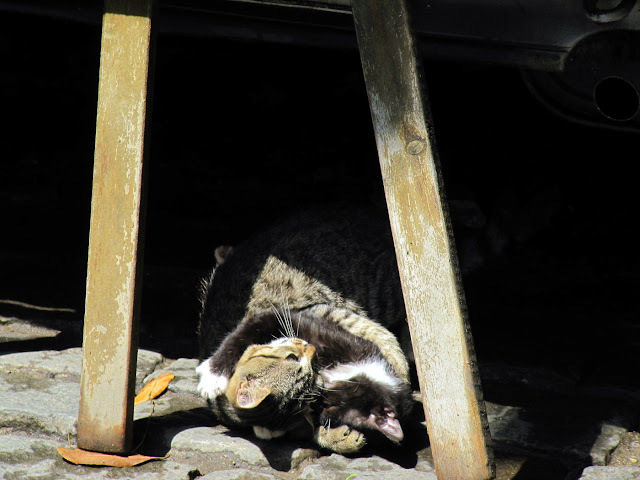 An article on Istanbul's cats in Pet Connections points to fascinating examples of these inter-species social dynamics at play. A professor from Bosphorus University speaks of the school's reputation for adopting stray cats, offering food and free "admission" to classes. Nükhet Barlas created an exhibition on cats in Istanbul for the city's term as 2010 "European Capital of Culture." She points to their friendliness and unique personalities, making them beloved members of many neighborhoods. In the United States, we're more likely to put nonhuman animals to death than allow them to roam the streets unsupervised. So there tends to be a mutual unease between humans and strays. 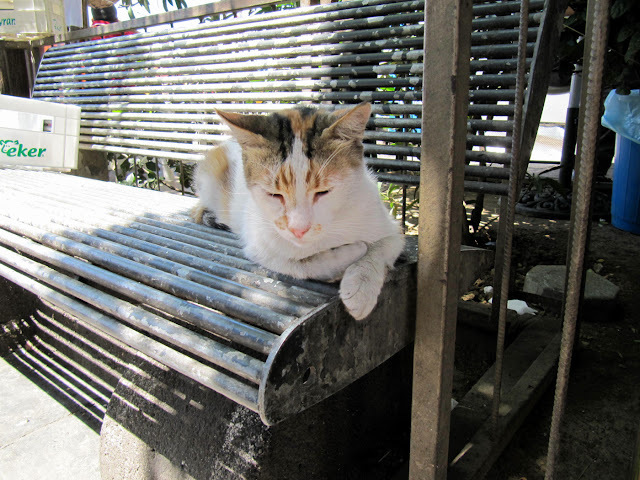 This unease is less evident in places where strays are a constant presence. 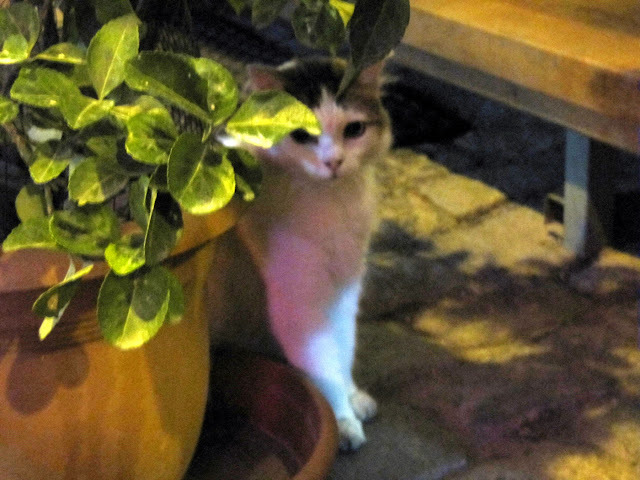 Is it possible that cultural traditions in Istanbul have genetically influenced local cats, making them more social in public space than their global counterparts? It seems that the behavior of cats can be explained, to a great extent, as a response to our behavior towards them. Based on a quick web search, the article "Behavioral Genetics and Animal Science" looks like a good starting point for finding out more about this phenomenon. Urban strays survive by their own means, suffer silently, or rely on the kindness of strangers. Considering how our behavior influences them over time could help us develop more humane and healthy cities. Credits: Photos by Nayer Khazeni. I want the lazy orange one. What about the insifferable noise they make at night? The fights? The love affairs? Why not talk about that as well? What I really don't like is tourists ooohhh-ing and cooing at the stray cats, feeding the apparently weak and shooing the apparently strong ones. Then being positively outraged when a naughty cat is send back to its place. Tolerance is the word. Cats are welcome as long as they stick to being what they are - cats. Not substitute humans. It doesn't help cats and it doesn't help the humans living with them on a day-to-day basis! Interesting points, Nicoleta. I know what you mean about cat fights. They would sometimes echo through the courtyard of the building where I was living this summer, making it so difficult to sleep. I hadn't even considered the influence of tourism. I'm not exactly sure what you mean by sending a naughty cat back to its place. Back to the streets? I think that most tourists do what we did--don't touch them :) but it seems that all of the cats are fed by someone, somewhere. 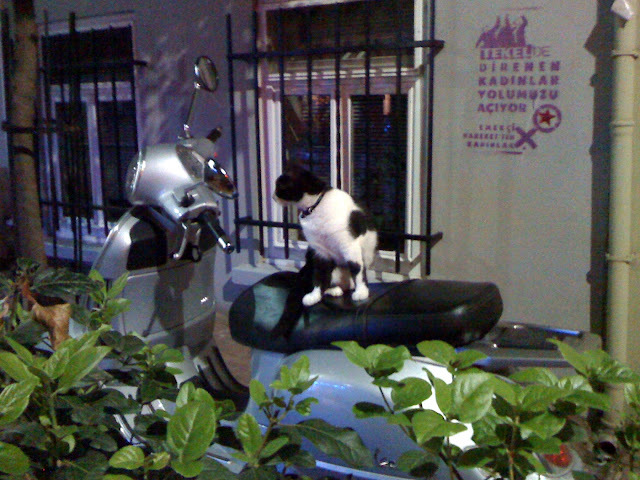 I got the feeling that they were the true police of Istanbul--watching, always watching. Israel has a similar problem with stray cats, and I believe they are ubiquitous in the Middle East. Why are they less common in the US? A scientist I talked to suggested that they would freeze to death each winter. But that doesn't explain the lack of cats in Florida or California. Perhaps it comes down to the availability of garbage to look for food in, or the presence of larger carnivores like coyotes in the US. Of course, American strays are terrified of humans, even if they know to be patient in case they've found a sympathetic biped. As for the cats of Istanbul, I've enjoyed them now for two consecutive winters. They are unobtrusive, if curious, and their calm presence gives the city a sense of decency lacking in America, where we're more likely to kill or abuse the animals. Of course, the stray dogs of Istanbul, like those of Athens, are well treated and accepted as residents of whatever neighborhood they frequent. Honestly, I have no idea how a cat, or a dog for that matter, could be mistaken for a human. I doubt the animals draw a pension. But I imagine that they have more right to complain about us than we have to complain about them: so they mew in the evenings? well, do humans speed through the streets in our shiny cars, risking their lives?